An intense cut-off low is expected to affect the Western Cape on Sunday into Monday. The public is advised that heavy rain and flooding is expected over the Garden Route, Overberg District and Breede River Valley. An intense cut-off low is expected to affect the Western Cape on Sunday into Monday. Strong to gale force winds are also expected along the south and south-western coastal areas on Sunday into Monday. Strong damaging winds often occur along coastal regions, but also often occur during thunderstorm activity. These winds are sudden and can cause much damage. Stay indoors where possible away from the windows that open towards the severe winds. Be aware of the following: – sudden cross winds if traveling especially between buildings, fallen trees or power lines and flying debris. Small boats must stay away from the open sea and seek the shelter of a harbour, river estuary or protected bay. Parked aircraft should be pointed into the direction of the wind and secured Listen to the radio or TV for warnings and obey the instructions from disaster management officers. Flooding occurs when water overflows its normal channels such as streams and storm water drains. It can occur with prolonged period of rain, with continuous heavy falls or in the form of flash floods which are usually associated with severe thunderstorms. Heavy rain may also result in river flooding causing damage downstream to areas that may receive no rainfall at all during the flooding event. If possible stay indoors and off the roads, avoid crossing rivers and swollen streams where water is above your ankles. If trapped in flooding in a vehicle, abandon it and climb to higher ground. In buildings, move valuables to a safe place above the expected flood level. Switch off electricity at the supply point to the building. In rural areas protect/relocate animals to a safe place on higher ground. Abandon your home immediately if evacuation is recommended, before access is cut off by flood water. NEVER drive on a road covered by water. You do not know how deep it is or if the road has been washed away. If the vehicle stalls, leave it immediately and seek higher ground. Be especially cautious at night when it’s harder to recognize flood dangers. Listen to the radio or TV for warnings and obey the instructions from disaster management officers. WARNING: Expected in places over the Central Karoo and Little Karoo (Western Cape) tomorrow (Wednesday). Whenever there are prolonged periods of little and no rain coupled with warm dry winds, veld or bush fires can easily be sparked and will spread rapidly in strong winds. Do not make fires in the open and/or leave fires unattended. Do not throw cigarette butts out of cars or in the open veld. Do not throw bottles in the veld as they can magnify the sun’s rays and start fires. Prepare and maintain fire breaks in controlled manner. In the case of a large fire, report it immediately and move away from the area to let the professionals deal with it. Never throw water onto a fire started by an electrical fault or fires started by oil or paraffin lamps. In this case sand or a blanket should be used to smother the fire. Listen to the radio or TV for warnings and obey the instructions from disaster management officers. Veld fire conditions expected in places over the northern West Coast District and Peninsula of the Cape Metropole (Western Cape) today (Monday), but only in places over the Namakwa District (Northern Cape), Central and Little Karoo (Western Cape) tomorrow (Tuesday). Whenever there are prolonged periods of little and no rain coupled withwarm dry winds, veld or bush fires can easily be sparked and will spreadrapidly in strong winds. Do not make fires in the open and/or leave fires unattended. Do not throw cigarette butts out of cars or in the open veld. Do not throw bottles in the veld as they can magnify the sun’s rays and start fires. Prepare and maintain fire breaks in controlled manner. In the case of a large fire, report it immediately and move away from the area to let the professionals deal with it. Never throw water onto a fire started by an electrical fault or fires started by oil or paraffin lamps. In this case, sand or a blanket should beused to smother the fire. Listen to the radio or TV for warnings and obey the instructions from Disaster Management Officers. the temperature exceeds a certain threshold, human’s ability to cool theirbodies through sweating is reduced. This can be a real threat that may leads to hyperthermia. Stay indoors in a cool room near a fan, if possible. The old and infirm must take extra care to stay hydrated and cool. Avoid strenuous outdoor activity, playing excessive sport and hard labour. Dress in light weight clothes and drink plenty of liquids, NOT alcohol. Listen to the radio or TV for warnings and obey the instructions from Disaster Management Officers. 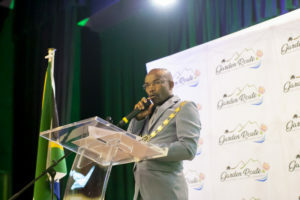 Heavy rain is expected in places over the Overberg District and the coastal areas of the Garden Route District today (Tuesday) into tomorrow morning (Wednesday). WARNING: Gale force W/SW winds of 65-75km/h is expected along the coast between Hermanus and Plettenberg Bay tonight (Monday), into tomorrow (Tuesday) morning. 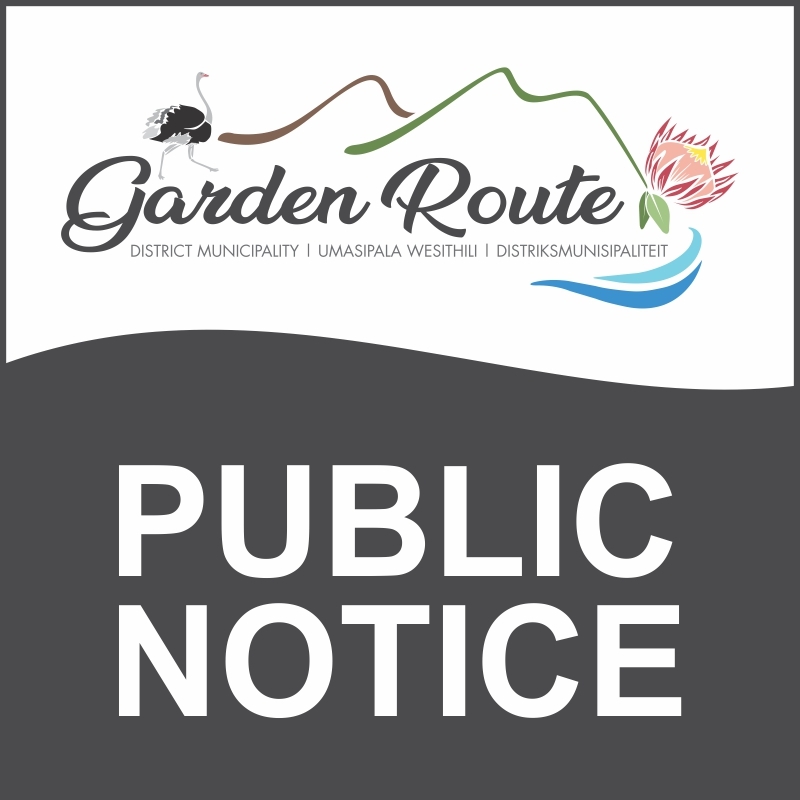 ADVISORY: Strong interior winds (50-65km/h) are expected over the Matzikama Municipality, Breede River Valley, Central and Little Karoo today (Monday), into early tomorrow (Tuesday) morning. Parked aircraft should be pointed into the direction of the wind and secured. Listen to the radio or TV for warnings and obey the instructions from the Disaster Management Officers. Generally heavy seas or damaging waves are a result of strong winds blowing over a large area called a fetch combined with low pressure systems. Long period swells are often very dangerous to tankers as they may literally snap them in half. Dangerous waves or surges may also be caused by storm surges and tsunami’s resulting in widespread coastal damage and loss of life. In oceanography, a sea state is the general condition of the free surface on a large body of water—with respect to wind waves and swell—at a certain location and moment. A sea state is characterized by statistics, including the wave height, period, and power spectrum. The sea state varies with time, as the wind conditions or swell conditions change. Ships should “idle” into the swell and wind so that the bow of the ship always faces the oncoming swell. If in a small sailing vessel reduce the sail area and steer into the oncoming swell. If along the shore-line stay well back from the highest high water mark as Secure all hatches, doors, windows and ports. Secure all loose items in the interior. Pump the bilge’s dry and keep pumping them dry at regular intervals. Stow away all loose gear and lash down any large items that cannot be stowed. Break out your life preservers and inform your crew that everyone will be putting them on well in advance of their necessity. Break out emergency gear like flares and first aid kit, sea anchor, safety harnesses, etc. Check your position and update your course as plotted on your chart. Prepare alternative routes to more protected areas. If you think you will be in for relatively long haul prepare some hot soup, coffee or stew freak waves may run up beyond the normal high water mark. If the sea recedes exposing rock and sea bed normally not exposed immediately seek higher ground at least 50m above your current position. Do not try swimming or fishing or other marine recreation during these events. Only extremely experienced surfers will temp their fate under these conditions. 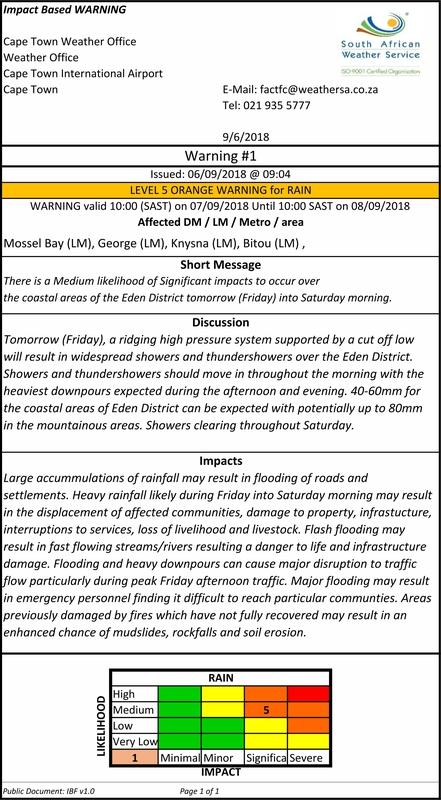 Level 5 Warning for RAIN for 7-8 September 2018. Please note that the YELLOW Level 3 Warning for RAIN issued yesterday remains in place for Hessequa Municipality for 7-8 September. 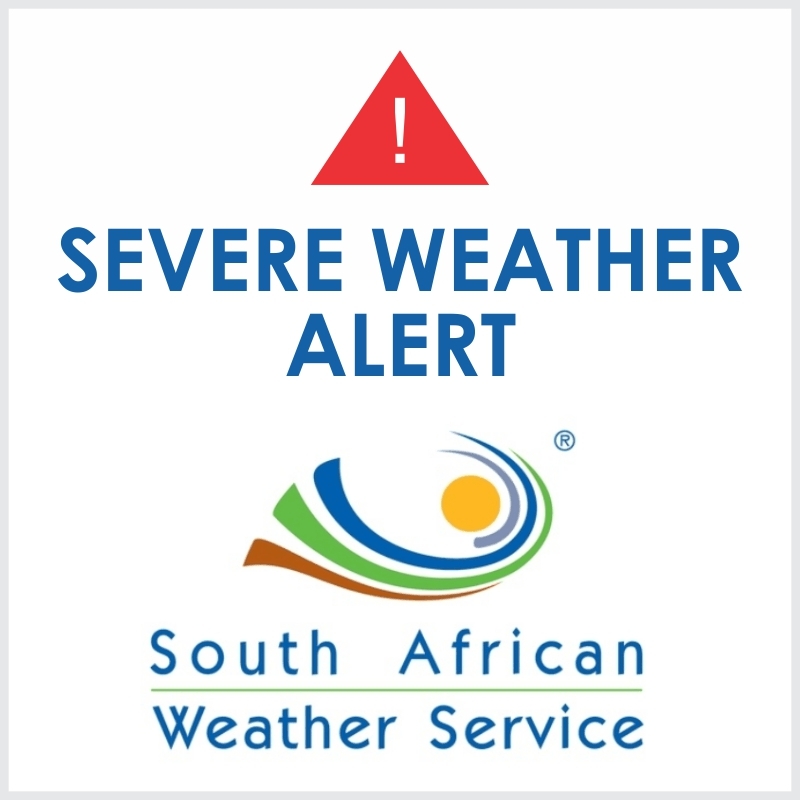 The Garden Route Disaster Management Centre in collaboration with the South African Weather Service will be monitoring the progress of this storm, please activate your local severe weather contingency arrangements and keep the Garden Route Disaster Management Centre updated of any severe weather-related incidents.